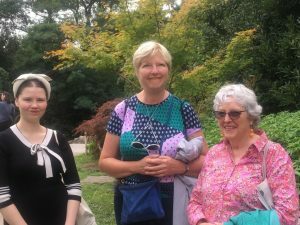 Helen showed us around the Kyoto Garden at Holland Park. The Kyoto Garden was opened in 1991. It was a gift from the city of Kyoto to commemorate the long friendship between Japan and Great Britain. 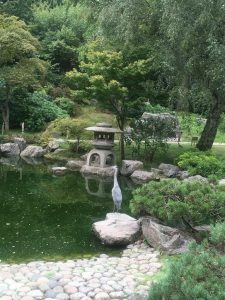 It is a Japanese “style” garden, as due to climate differences and native trees it cannot fully be Japanese. 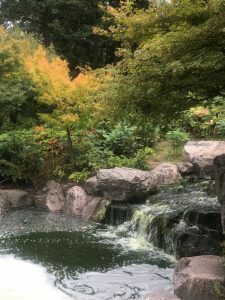 It features a waterfall, turtle island and a heron, (as well as peacocks that walk around the whole of Holland Park). The space is meant for quiet contemplation whilst walking around the pre-determined paths.